Today I am sharing an outfit I wore to a nice dinner with my family at a lovely lodge near our home. It was the first time in several weeks I had an excuse to dress up (even though this isn't dressed up in my general terms), so I took full advantage of the opportunity to take blog pics. 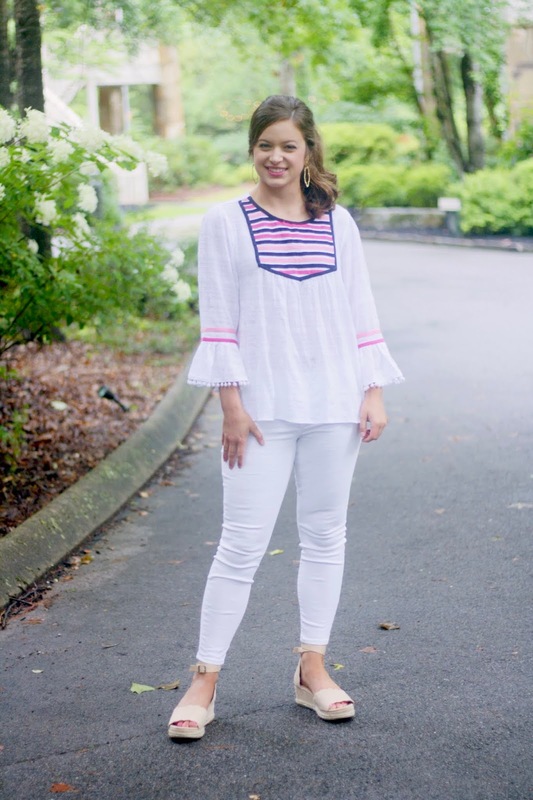 I enjoyed a delicious southern meal in this all white outfit, but luckily nothing got on this adorable blouse and my fave pair of white jeans! Buttermilk fried chicken with honey drizzle? Get it any time you see it on the menu- it's amazing!! My mouth is watering just thinking about it. Anyways, on to the outfit of the day!! 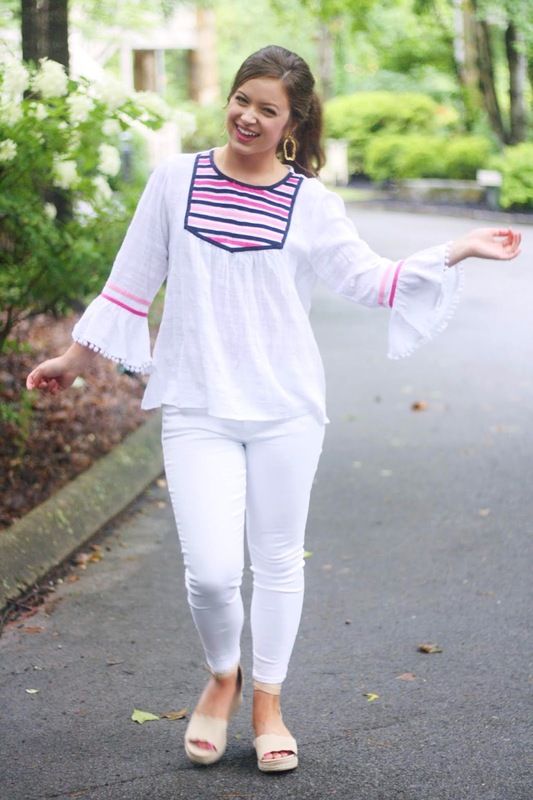 I paired this adorable flowy blouse from Crown & Ivy with white jeans to make this look extra-summery. 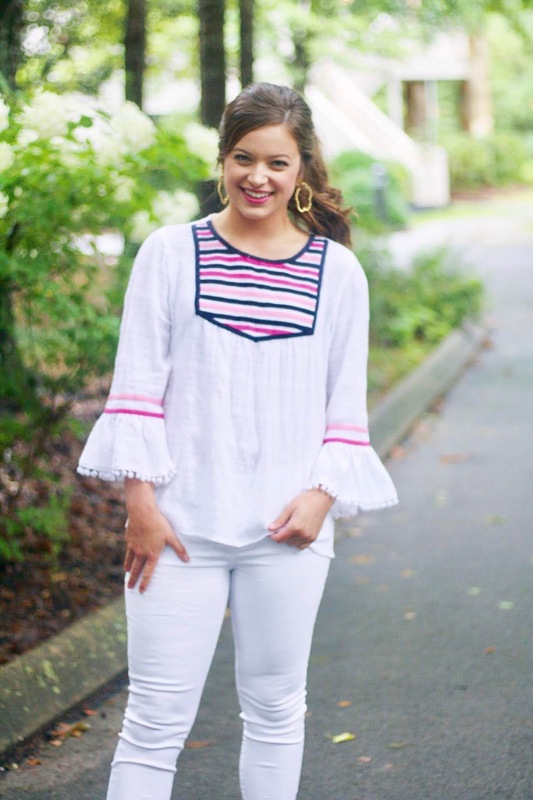 I find that pairing white on white makes your outfit perfect for any outdoor summer occasion, as it gives the appearance that you are bright and breezy! 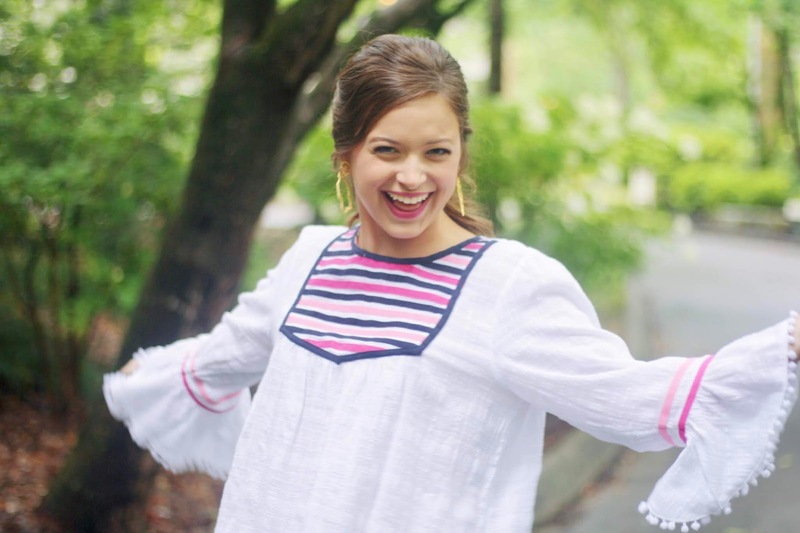 The details on this top are oh so cute- the pom pom fringe, navy and pink ribbon accents, and the fluted sleeves. 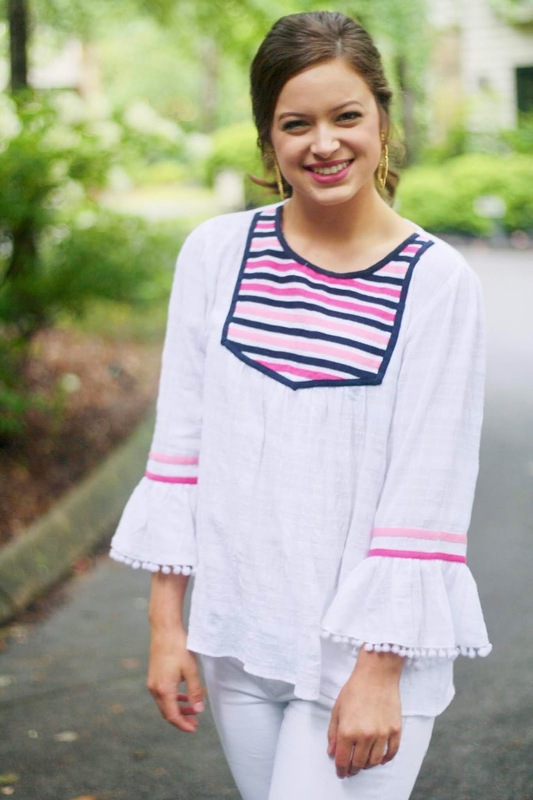 Sometimes tops these days can be a bit overwhelming with all the trends at the moment, but this top managed to pull in several trends and keep the look classic. 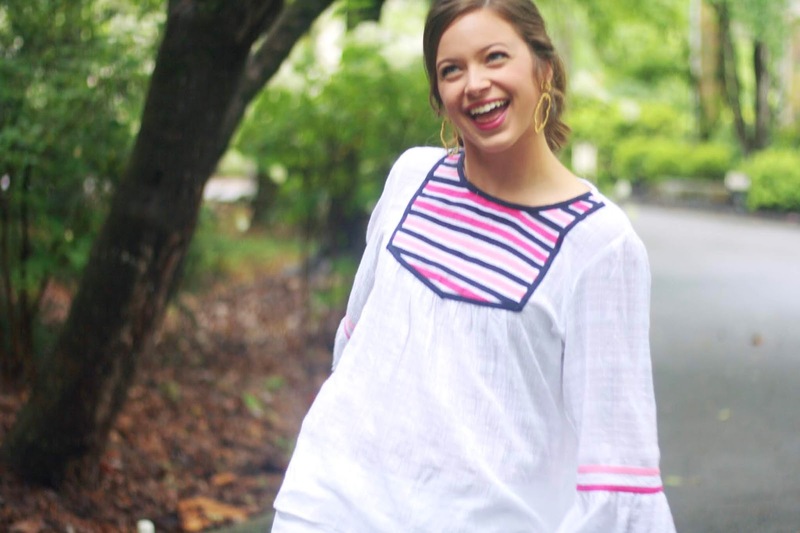 I love the way the top fits and flows, as it appears so elegant even though it is a pretty casual top. Because of the detail in the top, I kept my hair in a bouncy pony and threw on a pair of Lisi Lerch "hoops". This is my little trick to keep your outfit glamorous when your hair is either dirty/not having it/etc or you are dying from the summer heat (aka me!!). Adding just a bit of volume to the crown of your head and draping the heavier section of your "part" can up the elegance of this 'do even more. For more tips to achieve this look, check out this throwback post here. And the shoes. THE SHOES. They honestly can make or break an outfit. I'm loving these scalloped espadrille style sandals from Red Dress Boutique. They are a great way to add in small details without being over the top! I hope y'all enjoyed this short and sweet post! Sunday be on the lookout for another college related post, as I know many of you are heading off soon!